Do you need further help with your reading? This book is designed so that you can practice all the different types of reading questions you may get in the test. When you make a purchase, you will get three eBooks - the readings and questions, a book showing where the answers are, and a tips booklet. 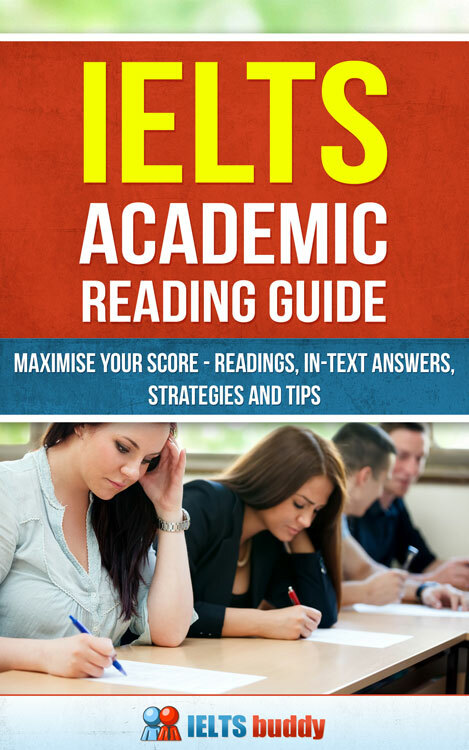 The Academic IELTS Reading Module takes 60 minutes and there are 40 questions to answer. Each question is worth 1 mark. There are three reading passages with a total of 2,150-2,750 words. Texts are taken from journals, magazines, books, and newspapers. All the topics are of general interest and the texts have been written for a non-specialist audience. The readings are intended to be about issues that are appropriate to candidates who will enter postgraduate or undergraduate courses. At least one text will contain detailed logical argument. One of the texts may contain non-verbal materials such as graphs, illustrations or diagrams. If there are technical terms which you may not know in the text then a glossary is provided. The texts and questions become more difficult through the paper. Instructions are clear and easy to follow and you will be provided with examples of any unfamiliar question types. Texts and questions appear on a Question Paper which you can write on but not take away from the test room. You must answers all questions on an Answer Sheet during the 60 minutes - there is not extra time at the end to transfer your answers to an answer sheet. The position of the questions varies - some of the questions may come before a passage, some may come after, depending on the question type. There is an answer sheet and you must enter all the questions on there during the test. There is no extra time at the end to enter the scores. As with the Academic IELTS reading, the General Training reading module takes 60 minutes, there are 40 questions, and each one is worth 1 mark. The readings are 2,150-2,750 words, each text being harder than the one before. In contrast to the Academic Reading, texts are taken from advertisements, notices, booklets, official documents, leaflets, newspapers, timetables, instruction manuals, books and magazines. They are all authentic. These are texts that you are likely to have to deal with daily in an English speaking country. This section contains 2-3 short factual texts with topics that will be relevant to your everyday life when you live abroad in an English environment. For example, a text may consist of a number of advertisements. There are 2 factual texts and they focus on issues related to work such as applying for a job, pay and conditions, staff training and development and company policies. The text in this section is longer and more difficult. It is a text on a topic of general interest.